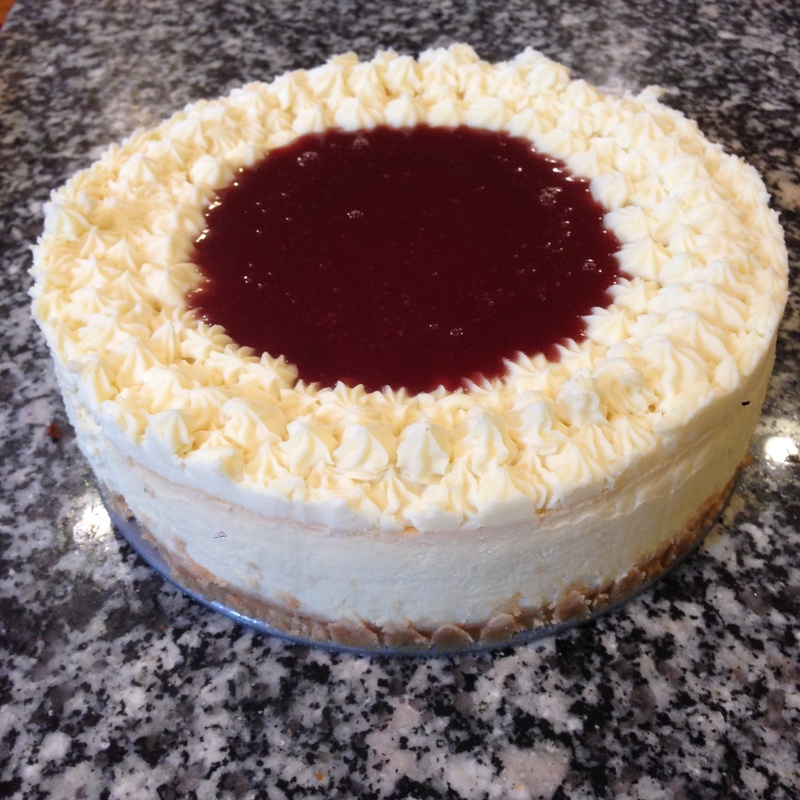 I had not made a cheesecake in a while, so I decided to bake a “simple” cheesecake for Christmas dinner. I switched up my previous white chocolate cheesecake recipe by substituting ricotta cheese for mascarpone cheese and also by adding a little bit more white chocolate. The result was a ridiculously smooth and soft cheesecake with a noticeable white chocolate flavor. I was a little rushed for time, so I pulled the cheesecake out of the oven after about 90 minutes of baking when the edges of the cheesecake started to brown nicely. Ideally, I probably should have either baked it a little bit longer (maybe 15-20 minutes or left it in the turned-off oven). I don’t think it was under-baked (maybe a tad), but I think this is difficult to determine due to the mascarpone and increased white chocolate. As you can see, it still sliced well. The center was definitely softer than the pillowy outer edge, though. I walked up and down the cookie aisle in the grocery store trying to figure out which cookie to use in the crust and settled on Vienna Fingers because of the flavor profile of the cheesecake. I think it was a great decision, and I really enjoyed the crust. I used all of the cookies in the package, so I had enough crumbs to build up the walls of the springform pan. Use Cuisinart food processor to blend cookies into fine crumbs. Melt butter and, in separate bowl, mix well into the crumbs and brown sugar. Pour the buttered, sugary crumbs into the springform pan, and firmly press the crumbs into the bottom of the pan and up the sides. Cover and refrigerate until cheesecake batter is ready. In Cuisinart food processor, beat softened cream cheese and sugar until smooth, then add cooled white chocolate cream mixture and continue to beat. Add in vanilla and mascarpone, then mix until incorporated. Add eggs, one at a time, and mix until just incorporated. Pour into chilled, prepared springform pan. Remove baking sheet from the oven and allow the cheesecake to cool. Transfer springform pan from the water bath once it has cooled, and allow cheesecake to cool completely. Run a knife along the side of the cheesecake to loose from the sides of the pan. Cover and chill in the refrigerator overnight (or at least a few hours).